Figure 1. Data source: Office of Climate, Water, and Weather Services, National Weather Service. Damage from severe weather in Missouri shows a different pattern than does damage nationwide. 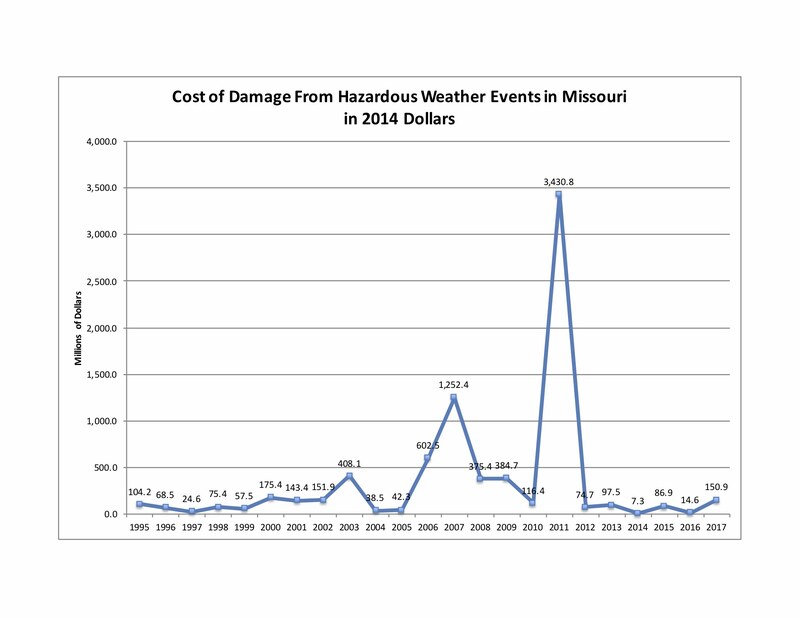 As Figure 1 shows, the cost of damage from hazardous weather events in Missouri spiked in 2007, then spiked even higher in 2011. Since then, it has returned to a comparatively low level. The bulk of the damage in 2011 was from 2 tornado outbreaks. One hit the St. Louis area, damaging Lambert Field. The second devastated Joplin, killing 158, injuring 1,150, and causing damage estimated at $2.8 billion. The damages in 2007 came primarily from two winter storms, one early in the year, one late. In both cases, hundreds of thousands were without power, and traffic accidents spiked. Office of Climate, Water, and Weather Services, National Weather Service. 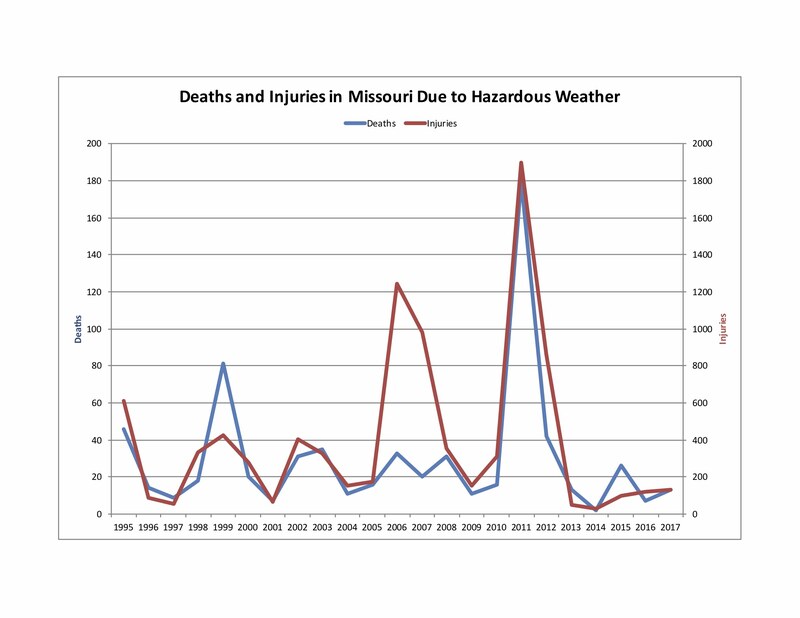 Figure 2 shows deaths and injuries in Missouri from hazardous weather. Deaths are in blue and should be read on the left vertical axis. Injuries are in red and should be read on the right vertical axis. The large number of injuries and deaths in 2011 were primarily from the Joplin tornado. In 2006 and 2007, injuries spiked, but fatalities did not. The injuries mostly represented non-fatal auto accidents from winter ice storms. The fatalities in 1999 resulted from a tornado outbreak. I understand the trends in both figures this way: once in a while, Missouri has been struck with catastrophic weather events. They cause lots of deaths and a lot of damage, at a whole different scale from years with no catastrophic weather event. In years with no such event, weather-related deaths in Missouri have been around 40 or fewer, and injuries have been roughly 400 or fewer. Damages in such years have been about $150 million or less. In years with catastrophic weather events, the totals can be much higher. 2017 was a year in which Missouri saw no weather disasters that caused such high damages, or killed or injured so many people. That does not mean that Missouri was unaffected, however. The state was included in several billion-dollar weather disasters, the most costly of which was probably the flood of April 25-May 7. That was a historic flood for many of the communities that were affected. The Missouri data covers fewer years than the national data discussed in my previous post. It also covers all hazardous weather, in contrast to the national data, which covered billion dollar weather disasters only. In addition, for some reason the Missouri data for 2018 has not yet been posted. While the national data shows a clear trend towards more big weather disasters, Missouri’s data does not. 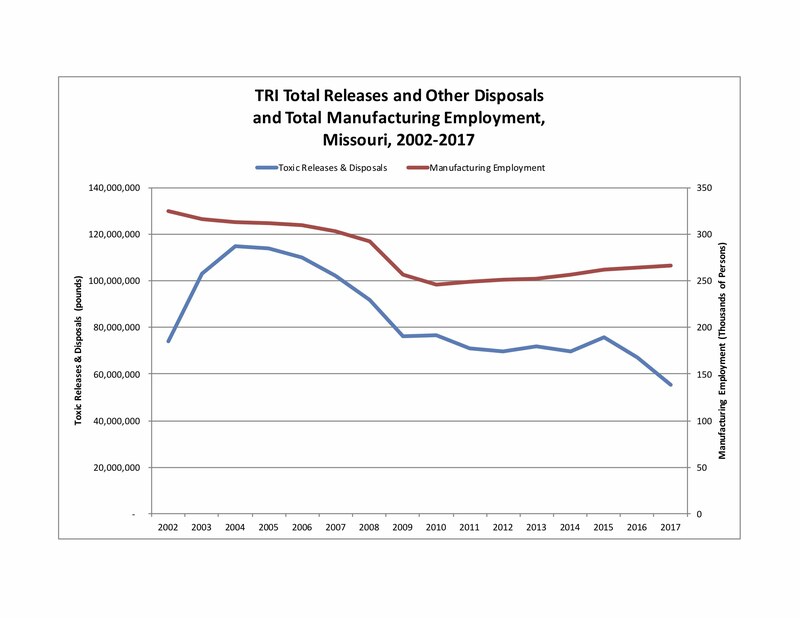 The Missouri data seems to reflect the kind of disaster and where it occurred. Tornadoes, if they hit developed areas, cause injuries, deaths, and lots of damage. Floods cause fewer injuries and deaths; damage can be significant, but it is limited to the floodplain of the river that flooded. Ice storms affect widespread areas; damages come mostly through loss of the electrical grid, which can cause widespread economic loss and from car crashes, which cause many injuries but fewer deaths. Office of Climate, Water, and Weather Services, National Weather Service. 2016. Natural Hazard Statistics. Data for Missouri downloaded at various dates from https://www.nws.noaa.gov/om/hazstats.shtml#. CPI inflation Calculator. 2019. 2017 CPI and Inflation Rate for the United States. Data downloaded 4/6/2019 from https://cpiinflationcalculator.com/2017-cpi-and-inflation-rate-for-the-united-states. National Centers for Environmental Information. 2019. 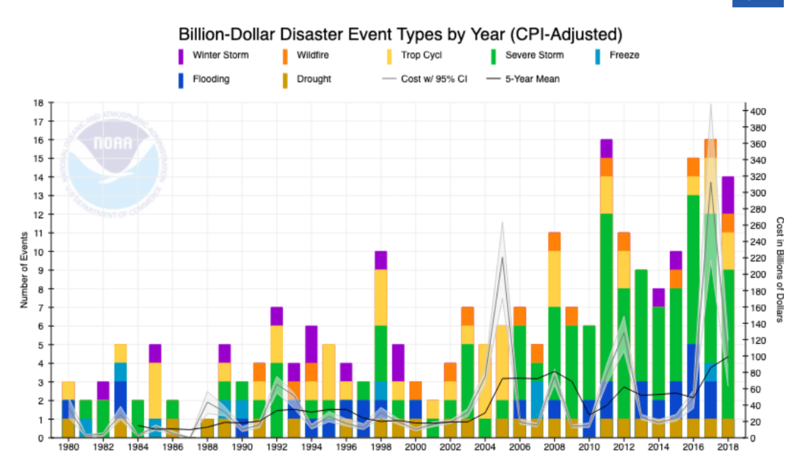 Billion-Dollar Weather and Climate Disasters: Table of Events. Viewed online 4/6/2019 at https://www.ncdc.noaa.gov/billions/events/US/1980-2018. Descriptions of specific weather events, if they are large and significant, can be found on the websites of the Federal Emergency Management Administration, the Missouri State Emergency Management Agency, and local weather forecast offices. However, in my experience, the best descriptions are often on Wikipedia. The previous post discussed the EPA’s Toxics Release Inventory. In this post, I will update toxic waste data for Missouri for 2017, the most recent year for which data is available. Figure 1. Source: Environmental Protection Agency, 2018. Toxics can be managed by (from most desirable to least) reducing their creation at the source, by recycling, by energy recovery, by treatment, or by disposing and/or releasing them. 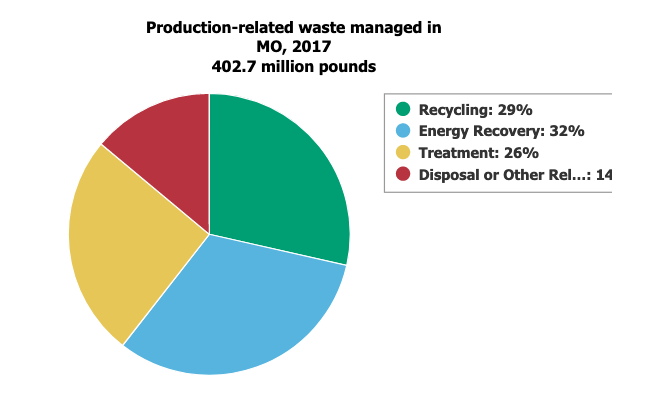 The Figure 1 shows Missouri managed toxic wastes in 2017. The largest amount was used to create energy (often this involves burning in a boiler). The next largest amount was recycled for reuse. Toxic releases can occur either onsite at the industrial facility that uses them, or offsite at some toxic materials treatment and storage facility. Materials can be released into the air, they can be discharged into surface water, and they can be dumped on the land. 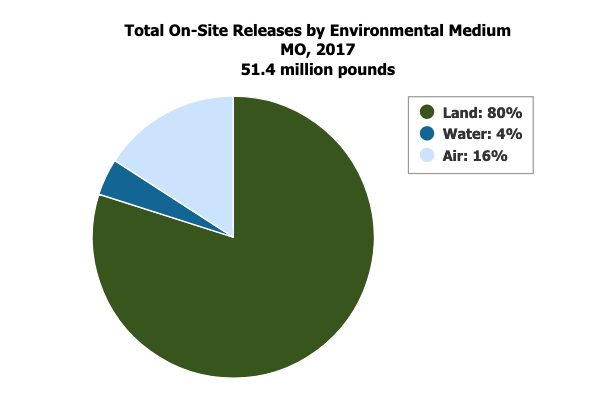 Figure 2 shows Missouri toxic releases by release category in 2017. By far the largest percentage, 80%, is dumped on the land. Figure 3. Data source: Environmental Protection Agency, 2019. The industries responsible for releasing the largest amounts of toxic chemicals are shown in Figure 3. Metal mining was the largest, accounting for almost half of all toxic releases, and electric utilities are second. Releases from the food industry continue to be larger than those from the petroleum, chemicals or plastics & rubber industries, and it continues to blow my mind! 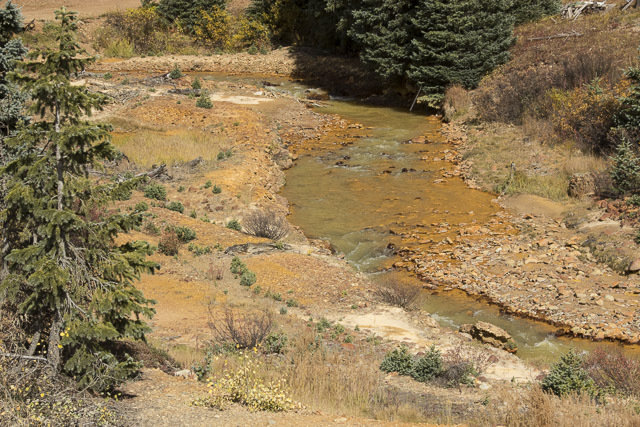 The 5 facilities that released the most toxic chemicals in 2017 were the Buick Mine/Mill, the Brushy Creek Mine/Mill, the Fletcher Mine/Mill, the Buick Resource Recycling Facility, and the Sweetwater Mine/Mill. 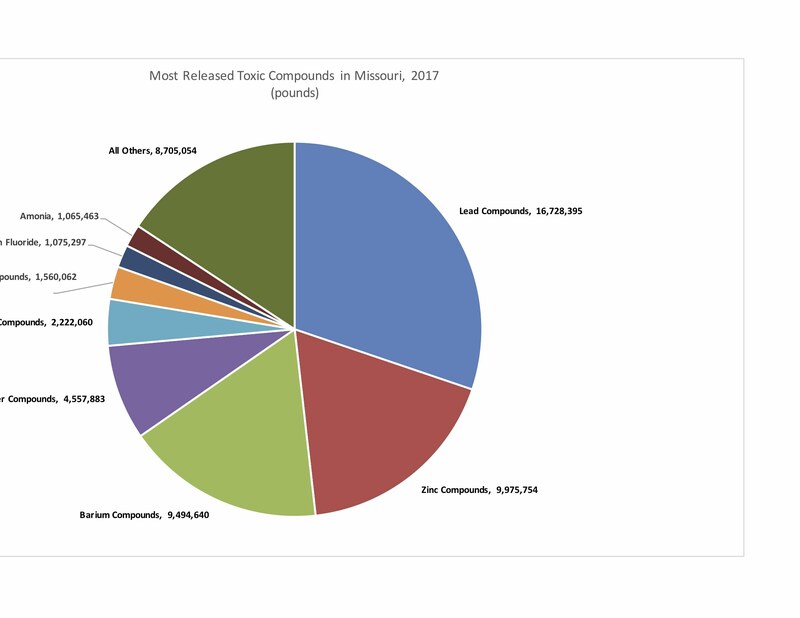 The chemicals that are most released in Missouri are shown in Figure 4. Compounds of lead zinc, barium and copper are the most released. 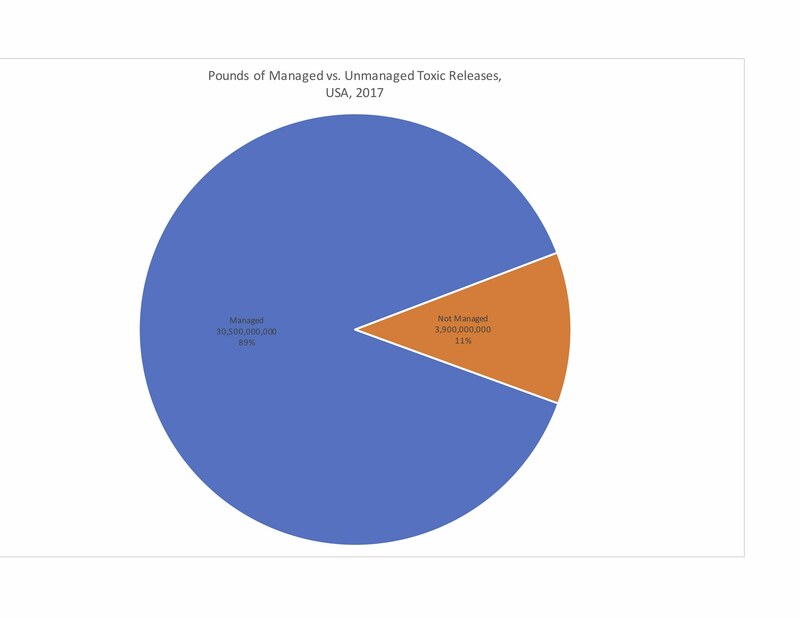 The majority of these releases are probably associated with the metal mining industry, and are released on the land. The top 5 chemicals released to air and water are shown in Figure 5. Hydrogen flouride comes mostly from coal burning power plants, while nitrate compounds come mostly from the food industry (think waste from animal feeding operations). Figure 4. 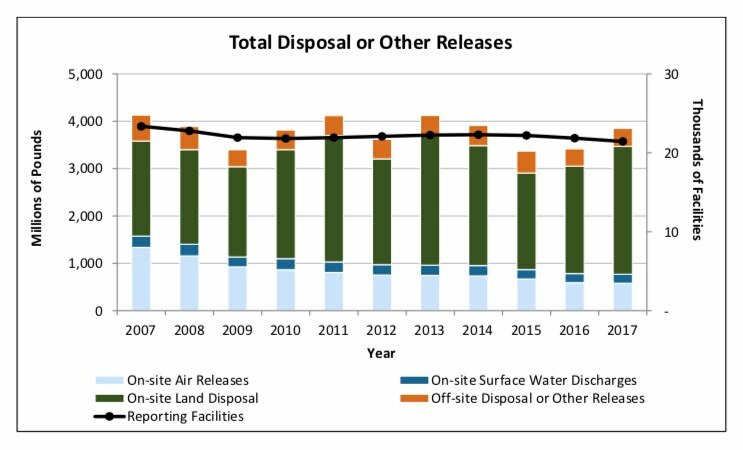 Data source: Environmental Protection Agency, 2019. Figure 5. Source: Environmental Protection Agency, 2018. Chemicals that are persistent, bioaccumulative, and toxic (PBT) are of most concern to the EPA. These are chemicals that remain in the environment and in the body. They build up over time, meaning that repeated small releases can lead to big trouble. 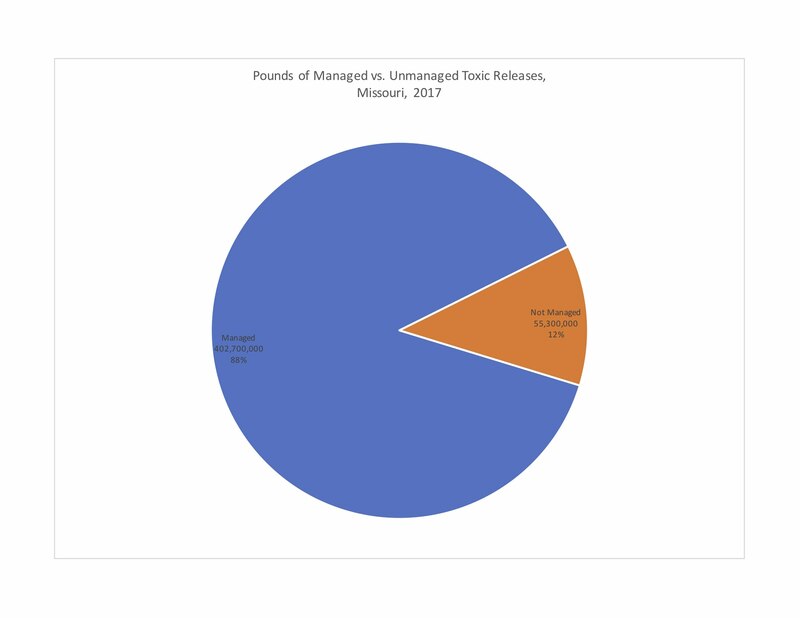 Lead accounts for more than 99% of PBT releases in Missouri. Mercury compounds are also a PBT of concern. Coal burning power plants are the largest source of mercury emissions in the United States. In 2017, Mercury emissions in Missouri fell to 4,423 pounds from 9,850 pounds in 2013. Two other classes of PBTs include polycyclic aromatics and dioxin/dioxin-like compounds. 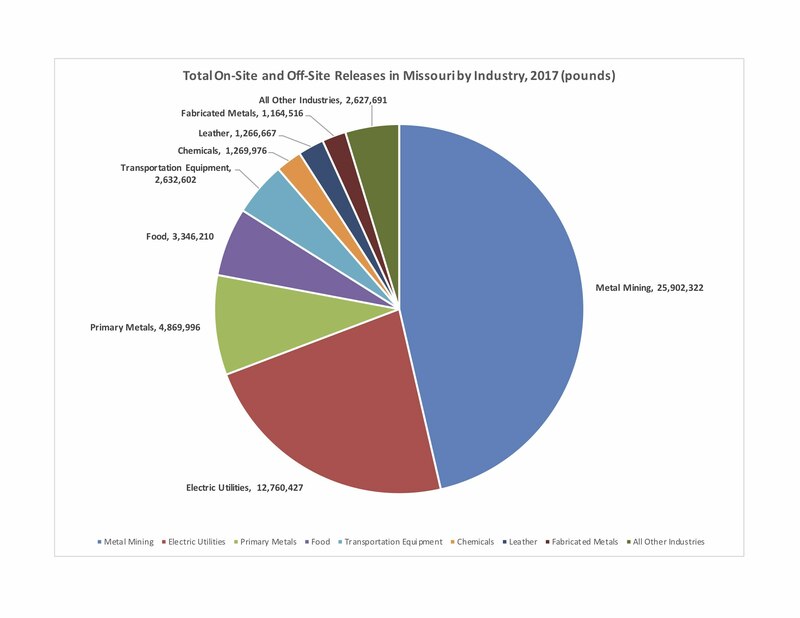 In 2017, 2,924 pounds of polycyclic aromatics were released in Missouri, and 0.08 pounds of dioxin/dioxin-like compounds. That may not seem like much dioxin, but this chemical is is toxic even in very, very small amounts. (EPA 2015). In the next post I will look at some toxic release trends over time. Environmental Protection Agency. 2015. Persistent Bioaccumulative Toxic (PBT) Chemicals Covered by the TRI Program. Viewed online 12/2/15 at http://www2.epa.gov/toxics-release-inventory-tri-program/persistent-bioaccumulative-toxic-pbt-chemicals-covered-tri. Environmental Protection Agency. 2019. TRI Explorer. This is a data portal that allows you to retrieve data regarding toxic releases by state, county, and municipality. It contains information by chemical, by releasing facility, by geography, and by industry. It also allows you to retrieve the data in a time series over several years. 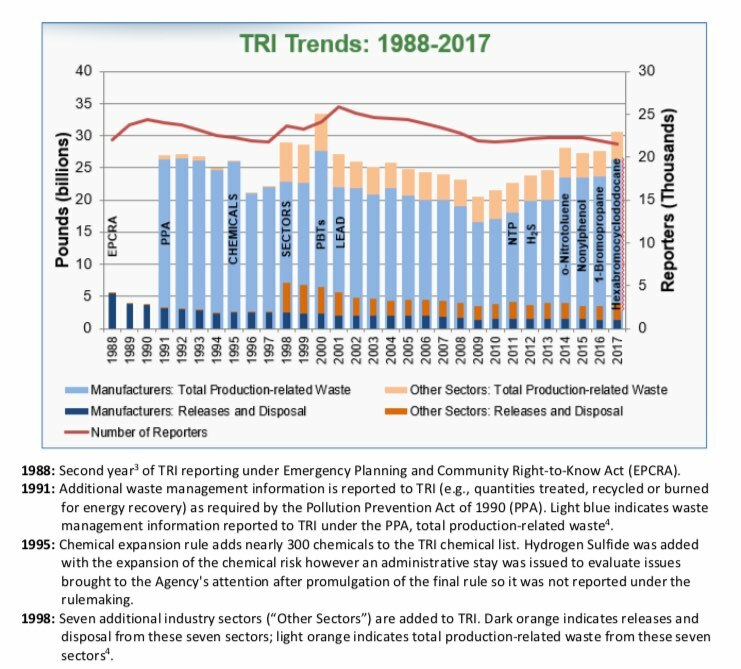 Viewed online 3/13/2019 at https://iaspub.epa.gov/triexplorer/tri_release.chemical. A recent article by Julie Turkewitz in the New York Times reports that a group of chemicals called per- and polyfluoroalkyl substances (PFAS) have leached into at least 55 drinking water systems at military bases around the globe. The contaminated water may be causing illness in those drinking it, including tumors, thyroid problems, and debilitating fatigue. The problem is not confined to military bases. As many as 10 million people could be drinking water laced with PFAS, according to the article. Of course, leaching into the public water supply is not one of their intended uses. Well, this blog is not about looking into the controversy around this group of chemicals. I thought I’d look and see if I could find any databases that document exposure to them. Lo-and-behold, I did. The EPA’s report on The Third Unregulated Contaminant Monitoring Rule (UCMR 3): Data Summary, January 2017 contains some information. 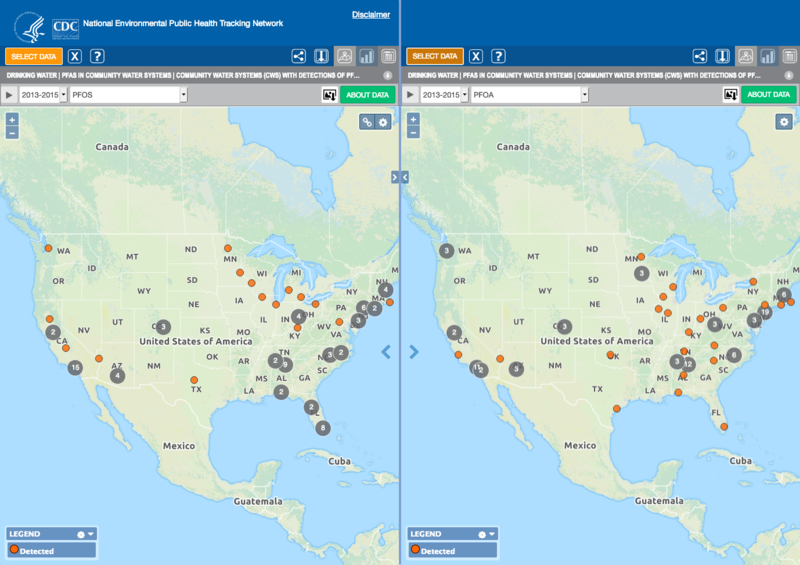 The National Environmental Public Health Tracking Network contains more. The data in the EPA report only has reports on PFAS from public water systems serving fewer than 10,000 people. Thus, it represents a small fraction of all public water systems, and an even smaller fraction of the number of people served by public water systems. 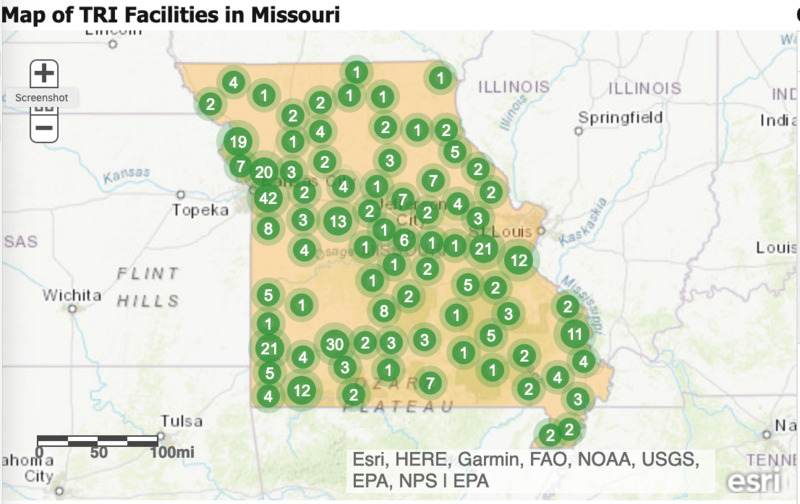 On the other hand, the data mapped by the National Environmental Public Health Tracking Network includes many of the largest public water systems, and covers a substantial portion of the population, at least in Missouri. In both sets of data, the group of chemicals are listed individually, and it is not clear how much the water systems contaminated by one overlap those contaminated by another. Finally, for several of the chemicals no reference level has been determined. Think of a reference level as something similar to the maximum safe exposure level. Some of these chemicals have not yet been studied that way, that’s why the EPA is undertaking the study mentioned above. Data Source: Environmental Protection Agency, 2017. Figures 1-3 map the locations of water systems where PFAS were detected, from the National Environmental Public Health Tracking Network. Each map is labelled with the specific chemical being mapped. The orange dots show a single system, the grey dots with numbers show locations where more than one water system had PFAS, but the scale of the map is too small to show them both. The number inside the grey circle shows the number of water systems in that locale where the chemical was detected. Figure 2. PFOS and PFOA Contamination. Source: Centers for Disease Control, 2019. Figure 1. PFHpA and PFBS Contamination. Source: Centers for Disease Control, 2019. Figure 3. PFNA and PFHxS Contamination. Source: Centers for Disease Control, 2019. Although 87 public water systems in Missouri were sampled, none reported detectable PFAS. The sample covered public water systems that served 3,802,254 people, and included the City of St. Louis Public Water System, the Missouri American St. Louis-St. Charles County Water System, the Kansas City Public Water System, 2 Jackson County Public Water Systems, the Springfield Public Water System, as well as many other large public water systems. The sampling included the Ft. Leonard Wood water system, and no contamination was detected. For right now, this data seems to suggest that the public drinking water in Missouri may not be contaminated with these chemicals. I wouldn’t say this is the last word, however. The EPA study will hopefully give us a more comprehensive analysis of what the health effects of these chemicals are, how much exposure of what kind is safe, and how much contamination is out there. Centers for Disease Control. 2019. 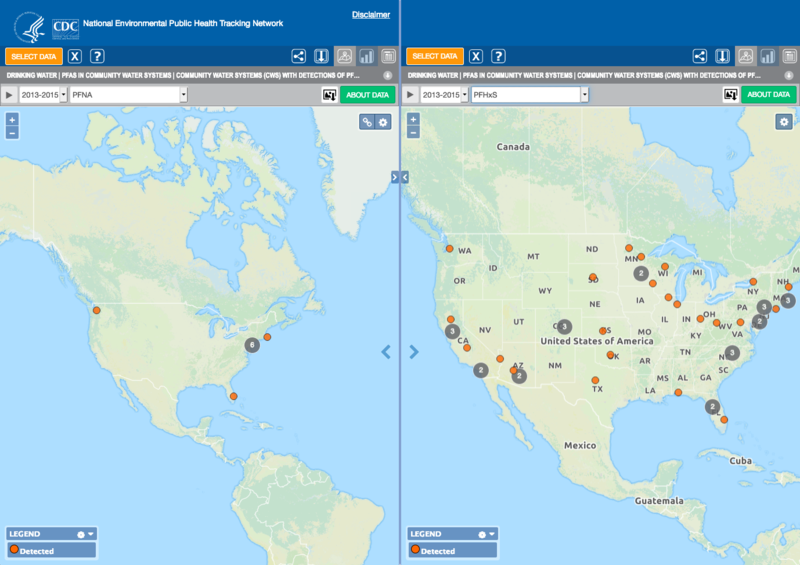 National Environmental Public Health Tracking Network. 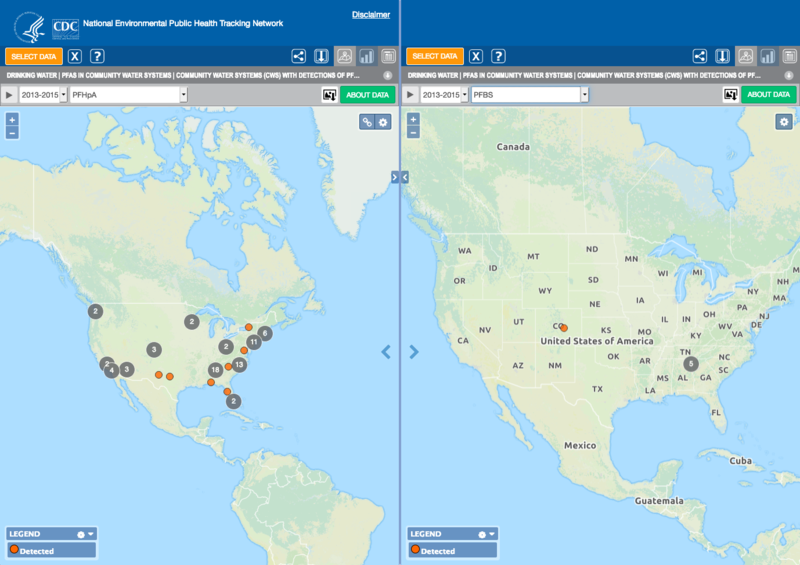 Viewed online 2/22/2019 at https://ephtracking.cdc.gov/DataExplorer/#/. Davenport, Coral. 2019. “E.P.A. Will Study Limits on Cancer-Linked Chemicals. Critisc Say the Plan Delays Action.” The New York Times, 2/14/2019. Viewed online 2/22/2019 at https://www.nytimes.com/2019/02/14/climate/epa-chemical-plan-pfas.html?module=inline. Environmental Protection Agency. 2018. Basic Information on PFAS. Viewed online 2/22/2019 at https://www.epa.gov/pfas/basic-information-pfas. Environmental Protection Agency. 2017. The Third Unregulated Contaminant Monitoring Rule (UMCR 3): Data Summary, January 2017. Viewed online 2/22/2019 at https://www.epa.gov/sites/production/files/2017-02/documents/ucmr3-data-summary-january-2017.pdf. Lipton, Eric, and Rachel Abrams. 2015. “Commonly Used Chemicals Come Under New Scrutiny.” The New York Times, 5/1/2015. Viewed online 2/22/2019 at https://www.nytimes.com/2015/05/01/business/commonly-used-chemicals-come-under-new-scrutiny.html?module=inline. This week I returned to St. Louis after being out of town for some time. I was greeted by a chorus of moans and groans about the horrible winter. Such kvetching! Of course, it is easy for somebody who has been in warmer climes to pooh-pooh the harshness of the winter back home. So, I decided to look and see what the statistics say, and since that is the focus of this blog, to do a post on what I found. I’m going to look at the winter in St. Louis and in Kansas City. For weather statistics, winter begins December 1st and ends February 28th (or 29th in leap years). I’m writing on February 21, so the data for this winter extends only through 2/20/2019. One final note: for grammatical reasons, in what follows, “normal” means historical average (mean). The weather service office in each location keeps its data in slightly different formats, so I will do one, then the other. First, let’s ask if it has been excessively cold in St. Louis this winter. According to the National Weather Service, the record low temperature in St. Louis is -22°F, which occurred 1/5/1884. The observed low this winter was -6°F, on 1/20/19: cold, but nowhere near the record. For the 82 days from 12/1/18 through 2/20/19, on 57 of the days the record cold for that date has been -5°F or colder. This year, the low temperature has been nothing like that. Figure 1. Data source: NOAA, National Weather Service, St. Louis Forecast Office. Well, you may say, perhaps the low temperature has not set records, but on most days it has been lower than normal. Figure 1 shows the daily observed low temperature compared to the normal low temperature for that date. The blue line shows the observed temperature for 2018-19, and the red line shows the normal low temperature for that date. 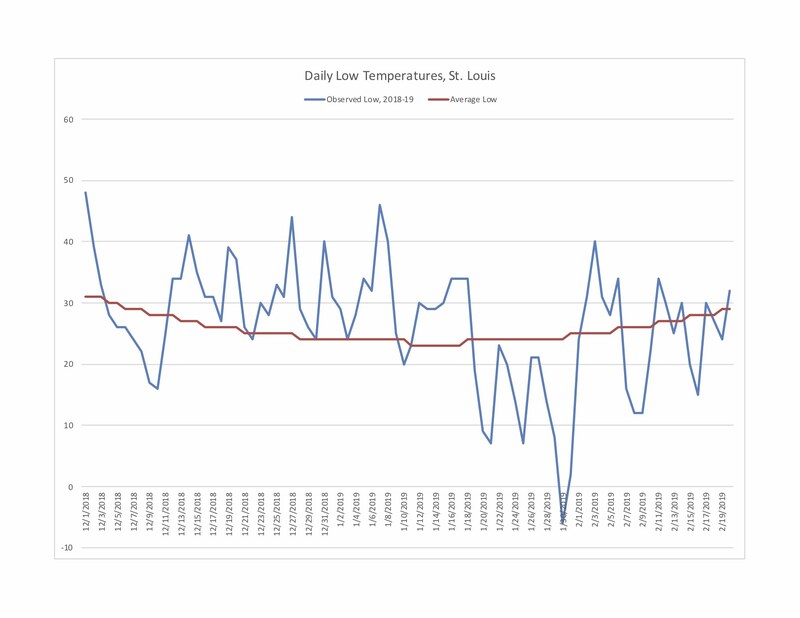 The chart suggests that for much of the winter, the low temperature in St. Louis has actually been above normal. There have been a few cold outbreaks, but not record cold. The observed low temperatures over the period this winter have averaged 27°F. The normal low temperatures over the period have averaged 26°F. So guess what? The average low temperature this year has been about a degree above normal. Figure 2. Data source: NOAA, National Weather Service, St. Louis Forecast Office. Well, you may say, perhaps the low temperature has not been excessively low, but the daily high temperature has been colder than usual. It’s not the deep lows of the night that has gotten to us, it’s the fact that it hasn’t warmed during the day. 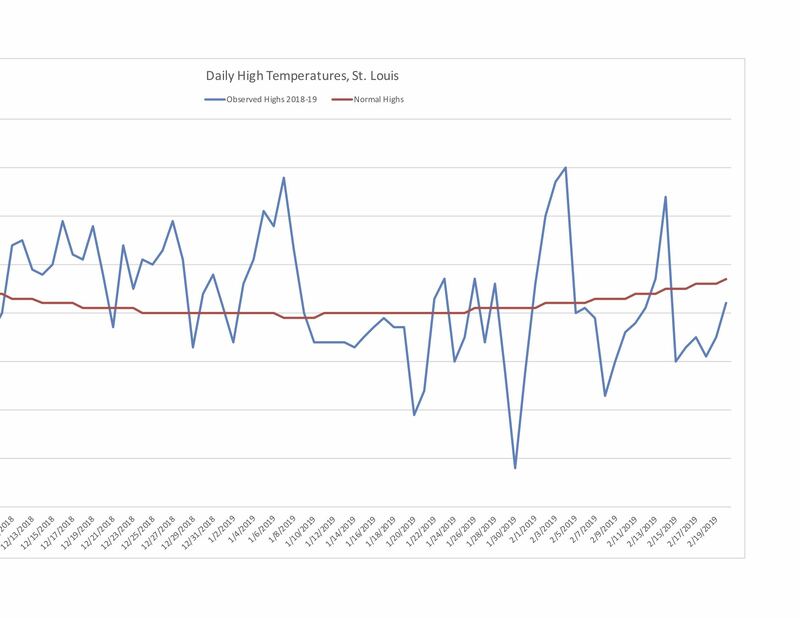 Figure 2 shows the daily observed high temperatures for 2018-19 (blue line), and the normal high temperature for those dates (red line). The chart shows that during the cold outbreaks noted above, the high temperature has, indeed, been cooler than normal. But much of the winter has also had highs above normal. Over the period, the observed highs this winter have averaged 43°F, while over the period, normal highs averaged 42°F. The National Weather Service Office in Kansas City does not seem to publish a data series that contains information similar to the one published by the office in St. Louis. I have used, instead, data from the Climate-at-a-Glance data portal. This data does not include daily values, only monthly averages. Plus, it only extends through the end of January. January 19 was the coldest day of this winter, however, so it is included. Data collection began in 1972-73. Figure 3 shows the data, with the blue line representing the observed values, and the gray line representing the average. The average temperature in Kansas City this winter was 2.5°F above normal. The month of February to date can be included by using heating degree days instead of temperatures. Heating degree days are a measure designed to indicate to what degree the interior of buildings will require heating. To calculate it, average a day’s high and low temperature, then subtract the result from 65. This is how many heating degree days there were on that day. Now, to measure a period of time, simply sum the heating degree days for each day in the period. The problem here is that the data in the climate summaries, where the heating degree data is published, use a different period to determine normal than does the data above. The data above uses values that run from when record keeping started to the current date. The climate summaries use data from 1981-2010. It was around 1980 that the effects of climate change really kicked in. This results in different estimates of “normal,” with the climate summary referencing only recent (warmer) history, and the other data referencing much longer (cooler) periods of time. Looked at this way, it would appear that December created about 11% fewer degree days than normal, but January and February (to date) have created about 2% and 11% more, respectively. 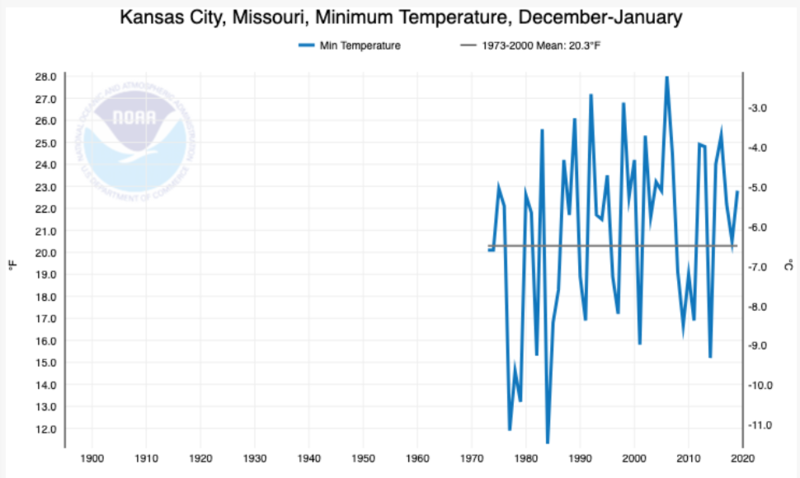 If you sum the differences for the 3 months together, then the winter to date has created 17 more heating degree days than normal, a trivial amount: in terms of heating degree days, Kansas City’s winter in 2018-19 should be understood to be roughly normal. Now, none of this speaks to snow or blizzards. I understand that the winter storm at the end of January was a terrible event. In a similar fashion, I was in Hawaii when the winter cyclone came ashore in early February. I saw whole fields of banana trees leveled, just snapped off mid-trunk. On the top of Mauna Kea, the wind was recorded at 190+ mph. None of that changes the fact, however, that Hawaii has a lovely climate, and it was a wonderful place to visit (although too crowded these days, I’d say). Same in St. Louis. This blog is more concerned with statistical trends than individual events, and none of the statistics suggest that this has been, on average, a freakishly cold winter. I read that people who believe in climate change are being peppered with the question “If the Earth is warming so much, how come it is so cold?” Nobody ever said that climate change would banish all cold, and the predictions are for more intense storms, just like the ones referenced above. But the real answer seems to be that it isn’t actually so cold, at least not here in Missouri. The whole question is nothing but phony baloney, at least here in Missouri. NOAA National Centers for Environmental information, Climate at a Glance: U.S. Time Series, retrieved on February 21, 2018 from http://www.ncdc.noaa.gov/cag. NOAA, National Weather Service, Kansas City/Pleasant Hill Forecast Office. 2/21/2019. Daily Climate Report. For this post, I used reports for 12/31/2018, 1/31/2019, and 2/20/2019. Viewed online 2/21/2019 https://w2.weather.gov/climate/index.php?wfo=eax. NOAA, National Weather Service, St. Louis Forecast Office. 2/21/2019. Climate Graphs. Data retrieved on 2/21/2019 from https://www.weather.gov/lsx/cliplot. 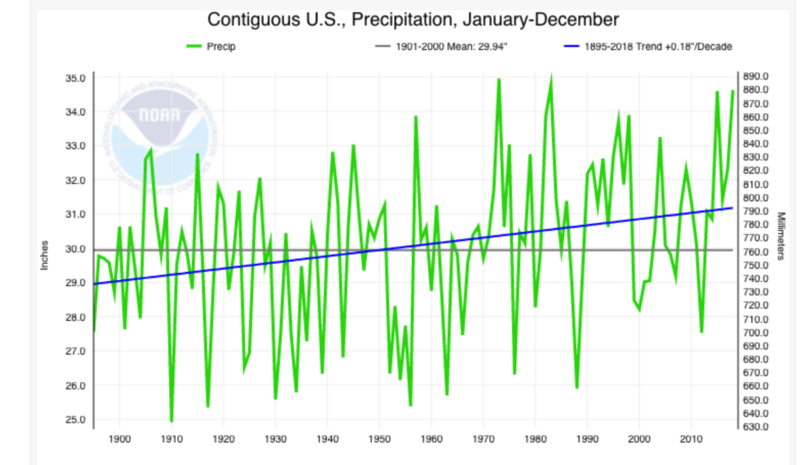 2018 was the 3rd wettest year on record across the contiguous USA. Figure 2. Source: NOAA Climate-at-a-Glance. In Missouri, 2018 was the 41st wettest year on record, with 43.04 inches of precipitation. (Figure 2) This puts the year 2.54 inches above the long-term average. 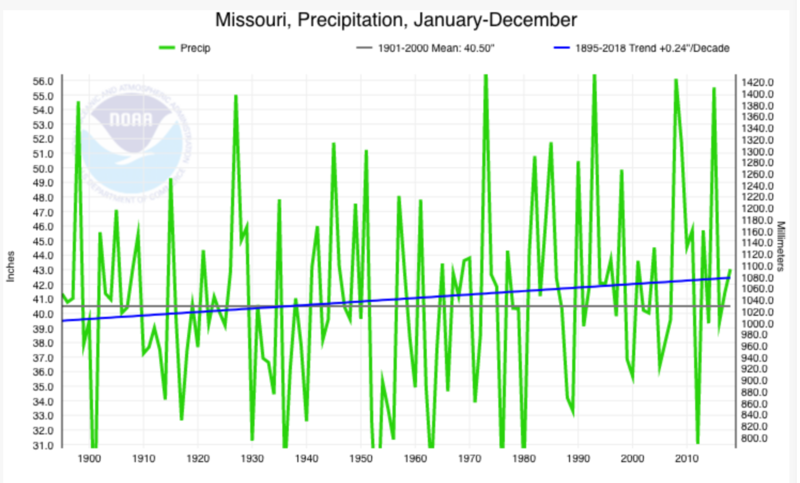 As expected, the variation from year-to-year is much larger than the change in precipitation over time, but since 1895 Missouri has trended towards about 0.24 inches more precipitation per decade. Unlike 2016 and 2017, 2018 did not bring epic flooding to Missouri. Perhaps the most notable thing about Missouri precipitation in 2018 were two almost out of season snow events – one over the Easter weekend in April, and one in mid-November. The latter heralded what has been a very snowy winter so far in 2019 for Missouri and much of the Midwest. Figure 3. Source: Source: NOAA Climate-at-a-Glance. The Northern Rockies and Plains are where most of the water that flows into the Missouri River originates, and the Missouri River provides water to more Missourians than any other source. This region saw 24.83 inches of precipitation in 2017, some 5.82 inches above average. (Figure 3) As expected, the variation between years is much larger than the change over time, but here, too, precipitation has been increasing, though the change has only been +0.07 inches per decade. Figure 4. Source: Source: NOAA Climate-at-a-Glance. As I reported previously, the California snow season started slowly this winter. It has been catching up, and is now nearly average for this date. The snowpack is above average in the Colorado River Basin above Lake Powell, the other major source for California’s water. The snowpack is 110% of the average for this date. (National Resource Conservation Service, 2/14/2018). 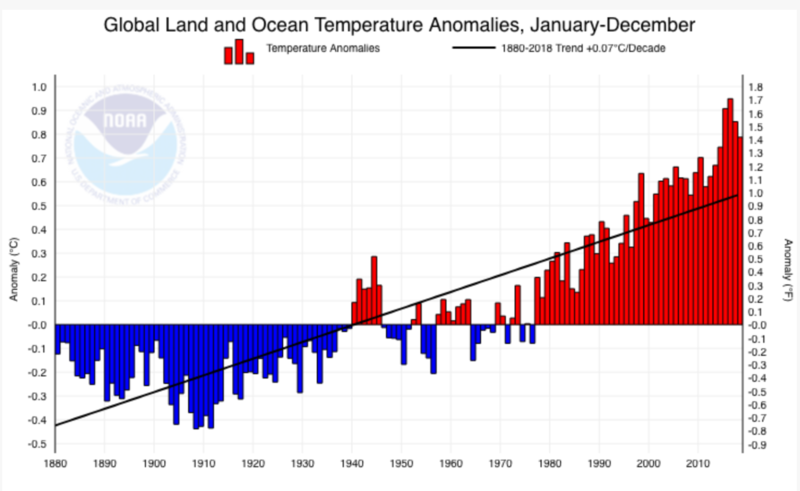 2018 was the 4th warmest year on record globally, and the 14th warmest for the contiguous USA. Figure 1. Source: NOAA Centers for Environmental Information. Figure 1 shows the average annual temperature for the Earth for each year from 1880-2018. The chart shows the temperature as an anomaly. That means that they calculated the mean annual temperature for the whole series, and then presented the data as a deviation from that mean. Degrees Celsius are on the left vertical axis, and degrees Fahrenhiet are on the right. Because the earth contains very hot regions near the equator and very cold polar regions, the actual mean temperature has relatively little meaning, and Climate-at-a Glance does not include it in their chart. 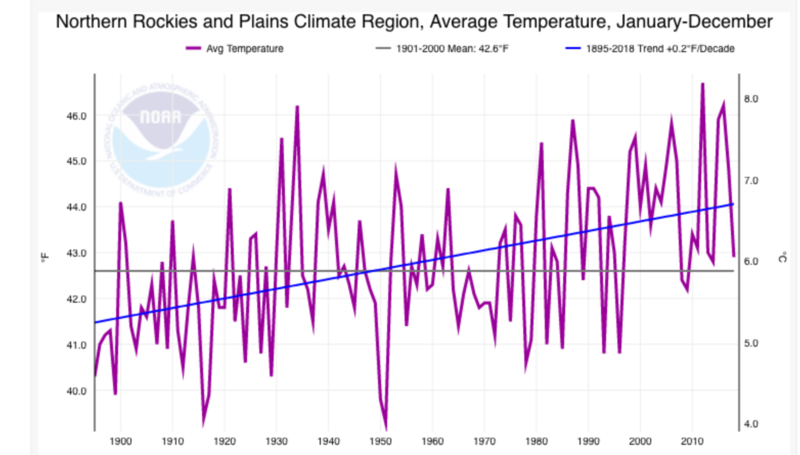 (All data is from NOAA, Climate at a Glance.) 2016 was the highest on record, and the 4 highest readings have all occurred within the last 4 years. You can see that the Earth appears to have been in a cooling trend until around 1910, then a warming trend until mid-Century, then a cooling period until the late 1960s or early 1970s, and then a warming period since 1970. Over the whole series, the warming trend has been 0.07°C per decade, which equals 0.13°F per decade. Since 1970, however, the warming has accelerated to 0.17°C per decade (0.30°F). Figure 2. Source: NOAA Centers for Environmental Information. Figure 2 shows the average yearly temperature for the contiguous United States from 1895 to 2018. In this chart and those that follow, the vertical axes are reversed, with °F on the left vertical axis, and °C on the right. The purple line shows the data, and the blue line shows the trend. 2018 was the 14th highest in the record at 54.58°F. The 4 highest readings have all come within the last decade. Over the whole series, the average temperature has increased 0.15°F per decade. Since 1970, however, the rate has increased substantially. Figure 3. Source: NOAA Centers for Environmental Information. Figure 3 shows the average temperature across Missouri for 2018. Across the state, it was the 35th warmest year on record, with an average temperature of 55.2°F. 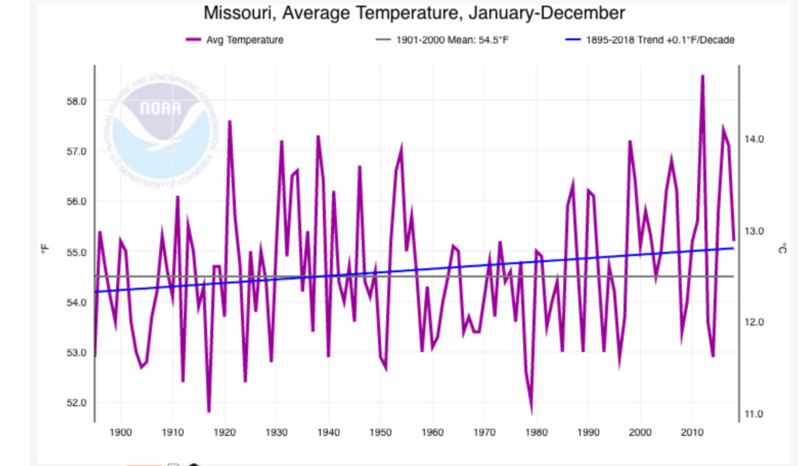 In Missouri, the warming trend from 1930-1950 was more marked than it was nationally; across the whole time period, the trend has been for a 0.1°F increase in temperature each decade. As was the case nationally, since 1970 the increase has accelerated. Figure 4. Source: NOAA Centers for Environmental Information. 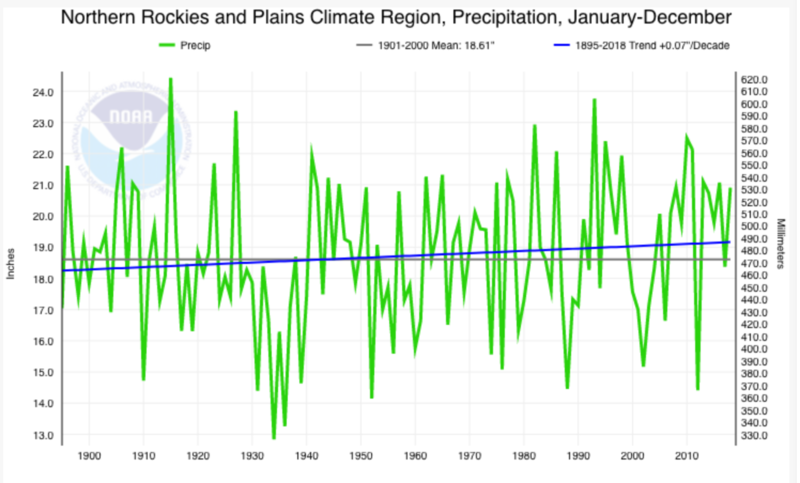 Because conditions in the Northern Rockies and Plains affect how much water flows into the Missouri River, which provides more of Missouri’s water supply than any other source, I have also tracked climate statistics for that region. Figure 4 shows the data. Last year was slightly above average for this region. This region has been warming at a rate of 0.2°F per decade over the whole period, and, since 1970, the rate has accelerated substantially. Figure 5. Source: NOAA Centers for Environmental Information. 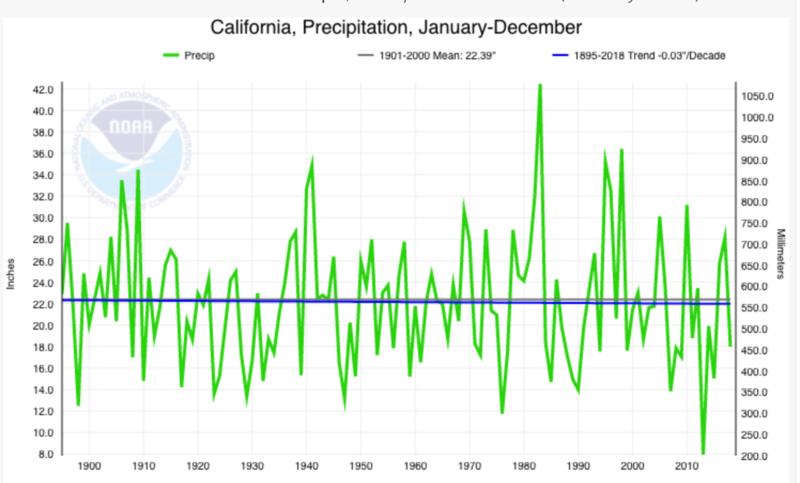 Because I have been concerned about the water supply in California, I also track the climate statistics for that state. Figure 5 shows the data. Last year was the 3rd warmest year in the record, with an average temperature of 60.2°F. 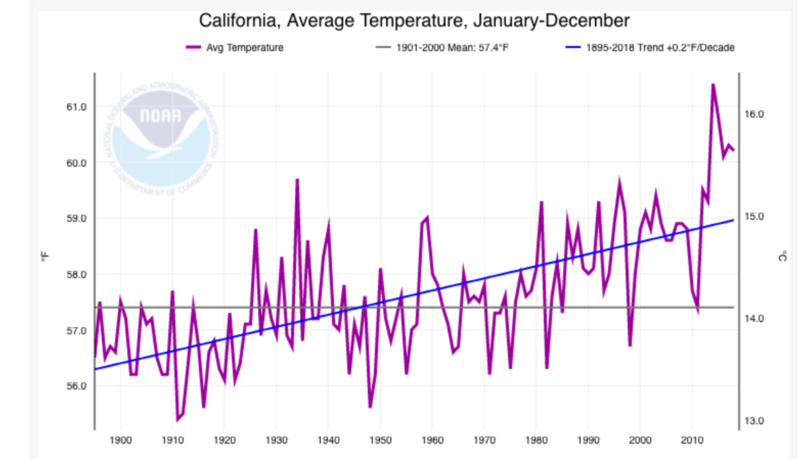 California has been warming at a rate of 0.2°F each decade. Since 1970 the rate of increase has accelerated substantially. 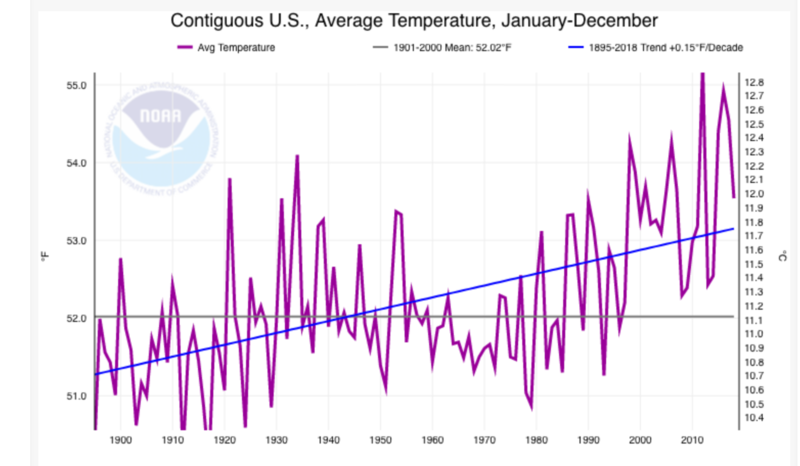 In all 4 locations the average yearly temperature seems to have increased significantly for several decades, then paused during mid-Century, and then resumed climbing, but at an accelerated rate. There seems to be little doubt that across the country it is warmer than it was. In Missouri, the average yearly temperature has been increasing, but at a rate that is somewhat less than in the other locations I looked at. NOAA National Centers for Environmental Information, Climate at a Glance. Retrieved on February 1, 2019, from http://www.ncdc.noaa.gov/cag.